Entire computer — select this option if you want to create a backup of the entire computer image. When you restore data from such backup, you will be able to recover the entire computer image as well as data on specific computer volumes: files, folders, application data and so on. With this option selected, you will pass to the Destination step of the wizard. Volume level backup — select this option if you want to create a backup of specific computer volumes, for example, all volumes except the system one. When you restore data from such backup, you will be able to recover data on these volumes only: files, folders, application data and so on. With this option selected, you will pass to the Volumes step of the wizard. File level backup — select this option if you want to create a backup of individual folders on your computer. When you backup data in this mode, you can configure additional rules to include/exclude files of the specific type in/from your backup. When you restore data from such backup, you will be able to recover backed up files and folders. With this option selected, you will pass to the Files step of the wizard. [For entire computer backup] If you want to include in the backup one or more external USB drives, select the Include external USB drives check box. 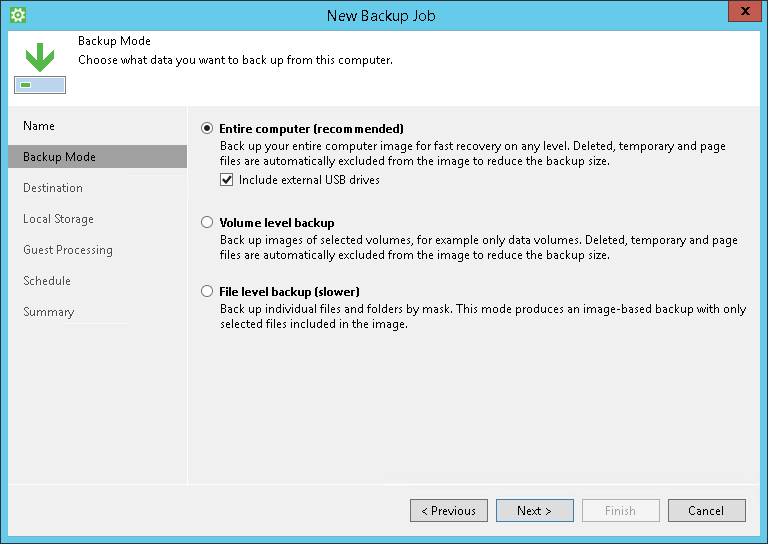 With this option selected, Veeam Agent for Microsoft Windows will include in the backup all supported external drives that are connected to the Veeam Agent computer at the time when the backup job starts. Veeam Agent for Microsoft Windows supports backup of external drives that support Microsoft VSS: HDD, SSD, and so on. USB flash drives (USB sticks) are not supported. To learn more, see Backup of External Drives. File-level backup is typically slower and requires more network traffic than volume-level backup. Depending on the performance capabilities of your computer and backup environment, the difference between file-level and volume-level backup job performance may increase significantly. If you plan to back up all folders with files on a specific volume or back up large amount of data, it is recommended that you configure volume-level backup instead of file-level backup.